Anything that makes personal finance easier is a bonus. A helpful way of thinking about our assets is to manage them across three hypothetical pots. The reason for doing this is that the pots tend to represent how we live our lives, thus making financial planning more intuitive and therefore accessible. What are the three pots? For simplicity, we name the three pots ‘daily’, ‘core’ and ‘long term’. This is also known as the ‘liquid pot’ and tends to contain the money we need for our living expenses. This pot has inflows from things such as our salary, share dividends or rental income if we have buy-to-lets and also funds our expenses, such as our basic costs as well as evenings out or other entertainment. We need constant access to the daily pot which will have regular inflows and outflows. This pot is likely to be held at the bank in an easy access account. Jumping to Pot 3, this is the long-term pot which tends to hold assets such as property, concentrated stock positions, direct investments in companies etc. These are investments which are typically more risky, higher cost and less transparent but which we expect over time will pay us high returns. We sometimes call this the ‘passion pot’ since it tends to be the area we are more interested in when it comes to investing. Pot 3 may also hold hobby assets such as art, wine, classic cars or boats. While this pot might deliver thrills, it’s not designed to aid our sleep. Now let’s discuss Pot 2. This pot holds what we term the ‘sleep well money’ and helps make us more efficient between Pots 1 and 3. Pot 2 is the safe house for investments that will need to help generate a secure income over the medium to long term – such as for school fees, retirement or for elderly care. It is usually funded by our savings in ISAs, pensions and general investment accounts. If Pot 2 is set up in a way which makes it flexible, transparent and low cost, it becomes the investment anchor to the more esoteric and less liquid holdings in Pot 3. Once we start thinking about our arrangements across these three pots the benefits quickly become evident. As with all aspects of our life a sense of order helps us to stay in control. When we segment our money it helps us to manage it better and put it to better use. While we need a certain amount of money to provide for us daily, we shouldn’t neglect our longer-term needs or forget to enjoy ourselves. 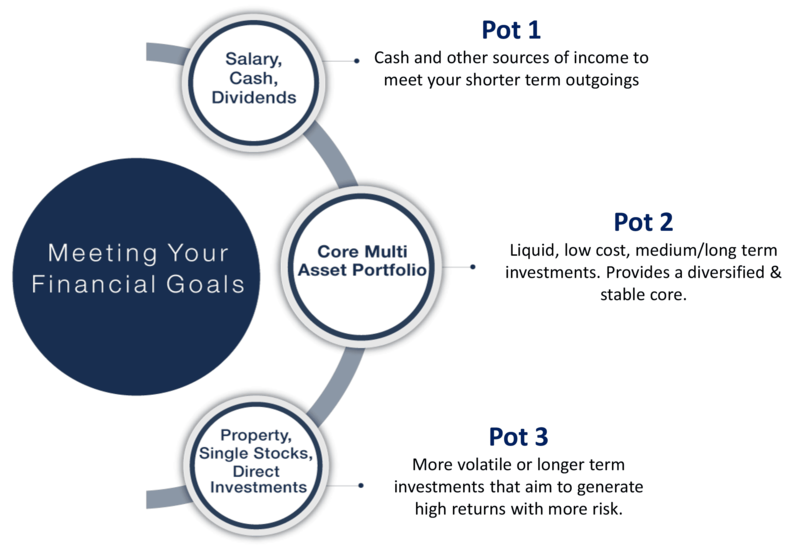 The three pots help us to assign our wealth according to our goals and our ability to fund them, and they help us keep track of all of our capital. Life would be rather humdrum if we didn’t treat ourselves, or pursue goals and hobbies that are meaningful and fun. By recognising how we divide up our capital with the three pots, we have the freedom to fund more passions and thus reap greater rewards, whether financial or psychological. At Netwealth we often emphasise that investors should pay attention to the factors they can control when investing. The three pot theory lends itself to efficient money management and, by clearly defining how our three pots are funded, and focusing on them as needed, we can take better care of our money and enjoy ourselves more.